St Andrews Great Ryburgh | John William "Charles" Cremer. This has just one name inscribed for the year 1914, that of John Cremer. This shows up the first discrepancy amongst the “names of the fallen” in Ryburgh because he does not appear on the “Think and Thank” Screen in St Andrew’s. Again according to Kelly’s 1933 “in 1921 a beautifully designed screen, containing on the front panels the names of the fallen under their regimental badges, and on the other side the painted figures of saints, was erected across the south transept at a cost of £240, as a memorial to those who fell in the Great War, and a thank-offering for those who returned". Neither is he in the Church on the hand decorated Roll of Honour of those who served. A look at the 1871 Census finds Esther then aged 17 with her youngest sibling John W. aged 2 in the collection of households in May Green Lt Ryburgh. Their parents are James (Ag.Lab) and Frances. Ten years on Frances is staying with her married daughter Evelina Lingwood in Sculthorpe and father James and 12 year old John live in the collection of cottages known as Old Toll Bar. This would seem to be the collection of cottages around the Stibbard crossroads and the old Toll Bar itself is seen in an early C20th post card occupying the corner plot diagonally opposite the cottages of today on the Stibbard side of the crossroads. John then seems to disappear from any further in the Census collections. 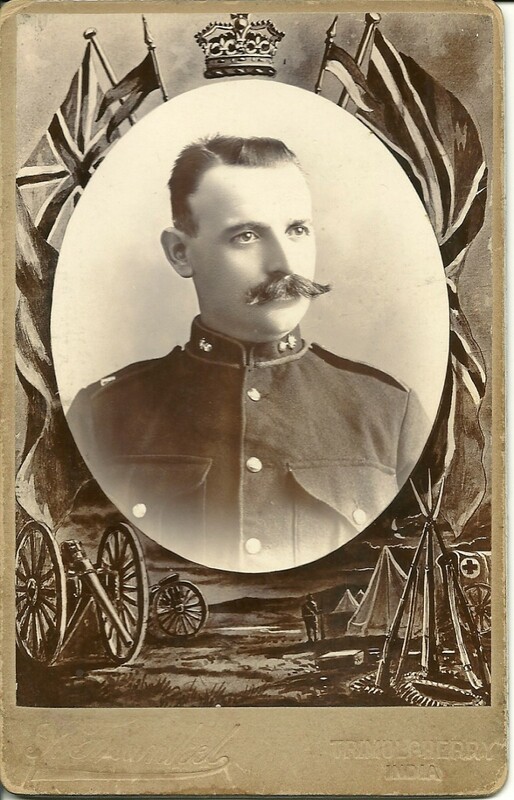 Working backwards from 1914, the records say that the only Cremer from Little Ryburgh to be killed in 1914 was a Charles Cremer a Saddler Sgt. No 82522 in the Royal Field Artillery, a regular soldier who served with the 47th Battery of the 44th Brigade of the Royal Field Artillery in the Expeditionary Force in France, Killed in Action 1st November 1914. He enlisted into the Army as a Gunner in the Royal Regiment of Artillery (with the regimental number 82522) in the first half of 1888, most likely signing up on the Long Service terms of 12 years with the Colours with the option of signing on again after the end of the term for another 6 or 12 years. On 1st July 1899 the Royal Regiment of Artillery was split into the Royal Horse artillery, the Royal Field Artillery and the Royal Garrison Artillery. Charles became part of the Royal Field Artillery and, in March 1900, after signing on again for a further 12 years service, he was transferred to the newly formed 149th Battery of the 50th (Howitzer) Brigade serving in the UK (at this time including Ireland) for the next number of years (37 battery had , after the Sudan campaign, been sent to South Africa to take part in the 2nd Boer War but Charles, being very nearly ‘time served’, had returned to the UK and was stationed at the Artillery Depot at Woolwich before re-signing). From this point, after a short spell of service on Gibraltar and/or Malta he was based at Bulford until the end of 1907 by which time he had been promoted to Saddler Corporal (he was also married in the first quarter of 1904 and became a father to two children (Bert and Frances) whilst here thereby moving out of barracks and into the Army families accommodation there) before being sent back to Hilsea, Portsmouth (possibly in an instructional capacity) where his third child (Edward) was born. In January 1909, he qualified for the issue of the Long Service and Good Conduct medal. At some point during 1909/1910, he was promoted to (Saddler) Sergeant and moved to Exeter (living at Countess Weir by 1911). Whilst living here, he was probably employed at the Okehampton artillery camp and ranges during the week. In 1913, 149th Battery was disbanded when the make up of artillery units was restructured (reducing the amount of artillery brigades to 40 (with a further 4 on reserve)) and it would appear that the men of the battery were all transferred to 44th Brigade (47th, 56th and 60th Batteries) with Charles, himself, being transferred to the 47th Battery As Charles appears to still have been serving at this point (under normal (long service) terms of enlistment, he would have entered the reserve in 1912) it would appear that he had either re-enlisted (again) under ‘short service’ terms at this point or he was, indeed, a reservist who was possibly still in the part-time employment of the army.Whatever the case, just over a year later, he was mobilized for active duty within the 44th Brigade RFA upon the Declaration of War on August 4th1914 and, a few days later was with his battery at Brighton. The position of 47 Battery leading up to John/Charles Cremer’s death can be traced in the 44th Brigade War diary for 1914 now available online from the National Archives. The 60th batt starting at 5am returned to the position vacated by them the previous evening, but later in the day join up with the 56th Batt near the HALTE. The 47th Batt also rejoined & came into action R of EKSTERNEST. About 7p.m. the 56th Batt was sent to support the 7th Division near GHELUVELT. The 47th and 56th remained in action for the night. Bde HdQrs staying in a house near the HALTE. In the evening about 4 pm both the 47th &60th Batts moved forward to a point about half a mile NE of the 2nd T(rench) of EKSTERNEST & dug in. Bde HdQrs moved to 1am (or arm) S of the R of EKSTERNEST. The detached section of the 56th rejoined its battery. They stayed in this position until November 1st. Shelled trenches in front of 6th Inf Bde and 4th Guards Bde. Fired at hostile Batteries by map and compass. “Black Maria” into our wagon line Sadd. Sgt Cremer, Dvr. Pitters, Dvr. Rudge, Dvr. Woodey, killed. Cpl. Jeffs, Dvr. Calder, Dvr. Crossby, Dvr. Kaye. Br Diehl wounded, 5 horses killed, 4 wounded. Bivouacked in action. I am writing you these few lines to express to you the deep sympathy felt by all the N.C.O’s and men of the battery as your terrible loss to you and your children, of such a splendid husband and father. The Sergeants and myself feel the loss of such a noble comrade very keenly, myself especially , as I was very much attached to your husband, in fact we always slept together since I joined this battery, and he always saw that I was quite comfortable before he would think of himself. He was the life and soul of everyone around him, and such a splendid soldier. He was our oldest soldier in the whole brigade, and also the oldest member of this battery; nothing seemed a trouble to him; he always did his work thorough, so his loss to the whole brigade is felt very keenly. Poor Charlie never suffered much agony; he died in a few moments, and he has been buried with three more of his comrades that served in the battery at home: Rudge, Pitters and Woodey; perhaps you will know them. We have made them a very pretty grave and erected a cross with their names on it. Capt. Dickson has promised if possible to take a photograph of it. If he is able to do so I will forward you one as soon as possible, so Dear Mrs Cremer I do hope you will be brave and bear this terrible blow. I am sure your dear little children will be well looked after, and you know how very sorry my Wife will be to know the sad news, and if you are ever needing any help go to her or write, she will be only too pleased to help you. I will enclose her address. So I will now draw a close, hoping that you may have health and strength to bear this terrible shock. It is to be hoped that Mary Cremer did manage to see a photo of her husband's "pretty grave" as during the course of the next 4 years the site and his remains became lost. He is therefore remembered at Ypres on the Menin Gate, Panel 5 & 9, just one of 54609 names of men who have no known grave.